In light of measles' recent resurgence in the United States, Dahl's take on the seriousness of the disease, the importance of immunization, and the inanity of refusing to vaccinate "out of obstinacy or ignorance or fear," is as relevant today as it was when it appeared, in 1988, in a pamphlet published by the Sandwell Health Authority. "It is not yet generally accepted that measles can be a dangerous illness," Dahl wrote in 1988.In 2015, many people still fail to fully recognize the dangers posed by measles, a grave and wildly contagious viral infection. Experts suspect many of us cannot appreciate the severity of a measles infection, because we have not lived through an epidemic; but the symptoms of measles – an airborne virus that Stephen Cochi, senior adviser with the CDC's global immunization division, calls "probably the most contagious infectious disease known to mankind"– are as serious as they are ghastly to behold. Measles is a dangerous illness. It's also preventable, thanks to a safe, affordable, highly effective vaccine. Epidemiologists know this. The CDC knows this. The World Health Organization knows this. The White House knows this. And, though he sadly did so more keenly and more personally than most Americans ever will, Roald Dahl knew this – just as any clear-headed person alive today knows it. The Guardian, in its November 1990 obituary for Dahl, called the beloved author "a children's champion." Certainly, the sprightly genius behind such books as Charlie and the Chocolate Factory, James and the Giant Peach, Matilda, Fantastic Mr Fox, and The BFG had more than earned the title. But the designation is so meaningfully augmented by Dahl's outspoken support of child vaccinations, and his condemnation of those who would ignore its benefits for reasons senseless and unfounded. Fifty years ago, there was a good and safe measles vaccine available to every family, and all you had to do was ask for it. In 1988, there was a good and safe measles vaccine available to every family, and all you had to do was ask for it. And today, there is a good and safe measles vaccine available to every family. 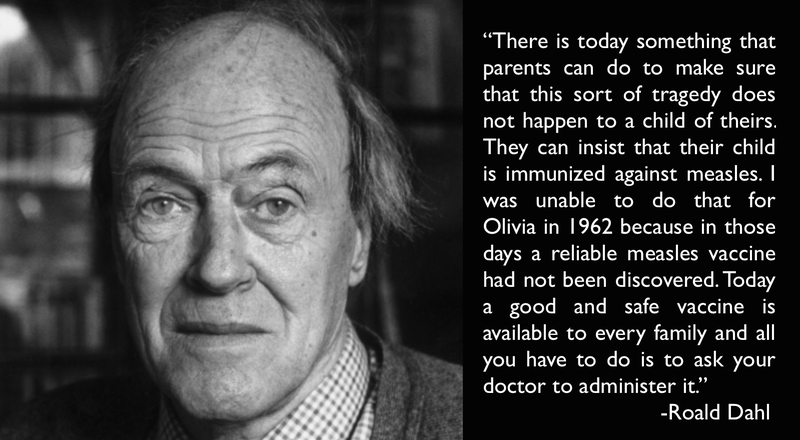 Correction: This post originally stated Dahl's pro-vaccination piece was published in 1986. It was published by the Sandwell Health Authority in 1988.